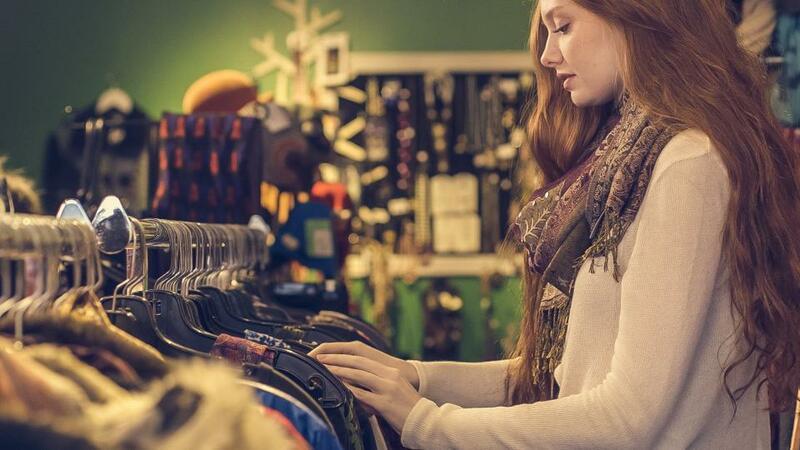 In this post, we’ve compiled some must-try marketing ideas for retailers. Check them out and see if you can make them work in your business. Before looking at fancy retail marketing tactics, start by leveraging the assets you already have. If your store is up and running, you likely have a lot of resources that you can use in your marketing efforts. The best way to attract and convert customers is to wow them with your amazing merch. See to it that you’re always stocking the right products. Then once you have the right merchandise, come up with creative displays and arrangements to make them pop. Not sure how to do that? Start by identifying your “Lake Front Property.” This is the area of your store that generates the most revenue. 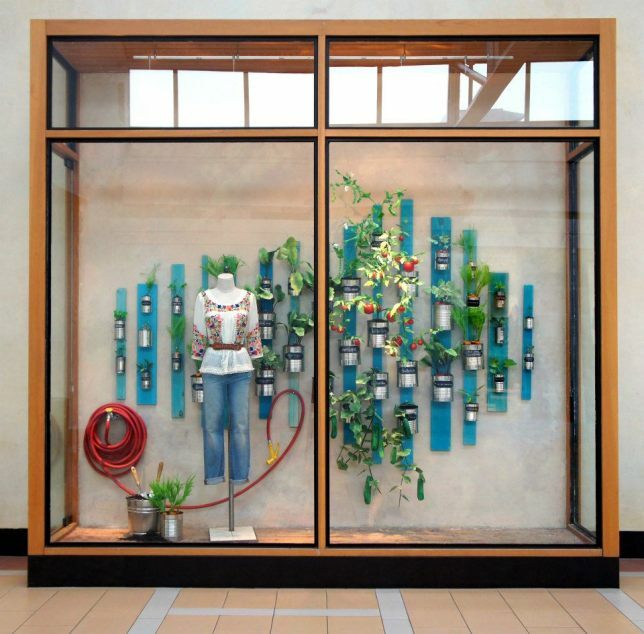 Window displays – Keep changing things up and try to update your displays at least once a month. For busy shopping seasons like the holidays, you want to do it every couple of weeks or even every week if possible. Every retail store is different, so certain design tips may work better for others. The “best” design or look depends on your customers, so zero in on who you’re targeting and craft your displays specifically for them. Also, consider telling stories with your displays. You can do this by selecting a theme, and finding stories in line with it. Check out what Anthropologie is doing. The apparel retailer changes the window displays of its stores depending on certain seasons or events. What makes their window displays great, though, is that Anthropologie always finds a unique angle or story within its chosen season theme. Curbside – Don’t neglect your curbside. In addition to keeping this space clean and tidy, consider adding “curbside extras”. 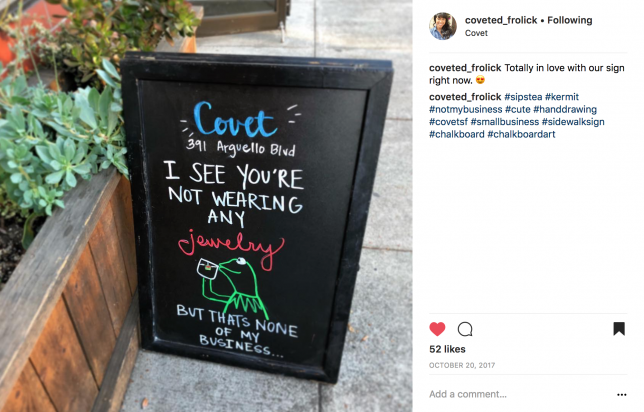 For example, why not set up a sandwich board outside your shop with some eye-grabbing text or art? Doing so can make passers-by stop and pay attention. Starbucks recognizes that happy and healthy employees perform better and are generally more pleasant. Walk into any Starbucks store and you’ll likely find enthusiastic baristas who chat up customers and recognize their regulars. Starbucks’ employees provide a great in-store experience that keeps people coming back. Here’s our point: employees could be your best marketers. It’s important to keep them engaged and motivated. Accomplishing that starts with hiring the right people and treating them well. Offer competitive compensation, provide ample training, and strive to be a great place to work. These steps will lead to happier employees and higher levels of performance, which in turn lead to better retail experiences and more satisfied customers. 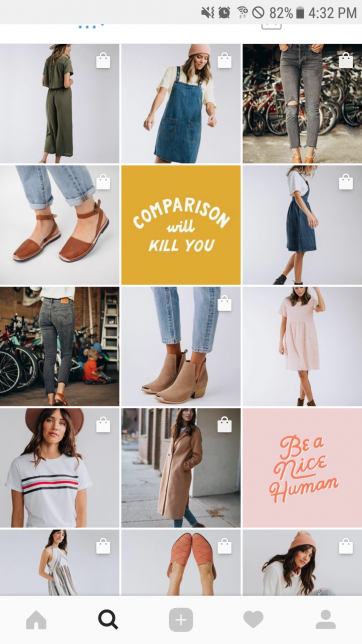 When it comes to retail and social media, there are three platforms you should seriously consider: Facebook, Instagram, and Pinterest. These are the most consumer-centric networks, making them ideal for merchants. Pinterest has the added edge of being a platform people specifically go to conduct research before they purchase something. Here’s the reality: if you’re a brand who wants to get more visibility on Facebook, you need to pay for it. The social network has been decreasing brands’ organic reach for some time now, but in 2018, we can expect business’ organic presence to decline even more. Mark Zuckerberg himself said that they will be rolling out changes to the News Feed to prioritize content from friends, family, and groups, so business pages will have to fight even harder to get exposure. Start a Facebook Group – Facebook lets you create Groups for your business or brand. Think of Facebook Groups as clubs or communities where your most engaged customers and fans can congregate. 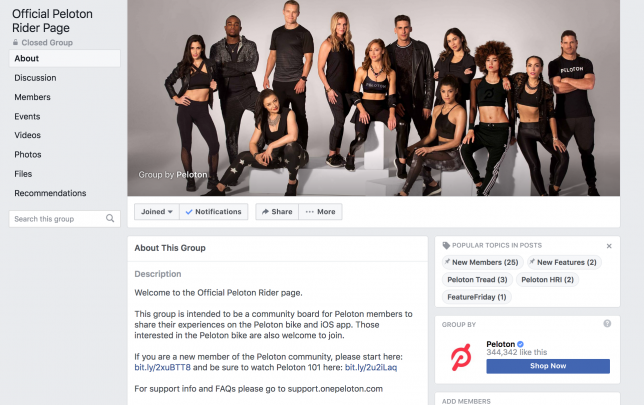 While you can talk about your products and business, the primary purpose of having a Facebook Group is to allow your customers to connect with each other. It’s not a place to shamelessly promote your business. The Group is very active, and people use it to share their workouts, ask questions, dish out tips, and more. See if you can do something similar for your Facebook presence. If you sell something that’s centered around a particular lifestyle or interests (e.g. fitness, food, crafts), then consider creating a Facebook Group for your patrons and potential customers. Run Facebook ads – If Groups aren’t your cup of tea, or if you want even more brand visibility on Facebook, then you’ll need to run Facebook ads to reach your target audience. The good news is, Facebook has a variety of ad products with robust targeting capabilities that let you zero in on your specific audience. The best thing to do is test different advertising solutions, then keep track of your metrics (e.g. clicks, engagement, sales, etc.) Take note of the numbers, then use those insights to determine your ROI. This will help you figure which ad types are right for you and how much to budget for Facebook advertising. Curate your visual content exquisitely – Your Instagram posts should be anything but random. You need to create a clear brand aesthetic so when people visit your profile, they get a quick idea of who your brand is. Check out Clad and Cloth’s profile. You can see instantly from their collection of photos that their brand produces casual clothing items and likes a clean neutral palette with pops of color. So, if you haven’t done so yet, spend time thinking about your brand aesthetic. Ask yourself, what kind of first impression do you want people to have about your brand? Find the answer then figure out how to make it come to life on your Instagram page. Make liberal use of Instagram Stories – Instagram Stories allow you to be more informal with your aesthetic, as people expect Stories to be more spontaneous and less curated. You can use them to give people behind-the-scenes glimpses at your store or showcase new products. 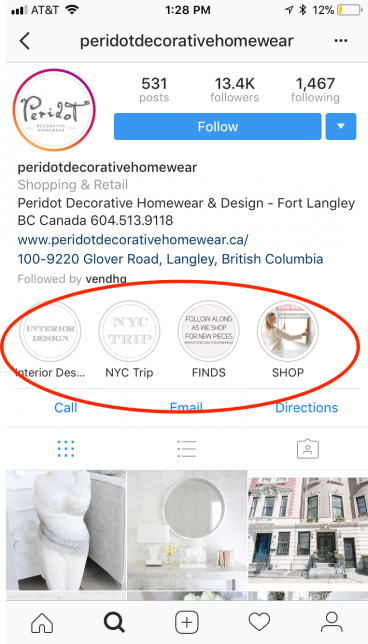 A secondary feature of Instagram Stories is that you can create a few permanent ones to display on your profile, highlighting things you really want your potential customers to see. Check out what Peridot Decorative Homeware is doing. The retailer uses these permanent Story spots to make it easy for people to view interior designs, shop for items, and more. They even created custom Story cover images to make them look more attractive! Hashtag it up – Research which hashtags are relevant to your brand and use them to help your photos surface in front of people you’d like to become customers. Pro tip: rather than putting the hashtags right into the caption, post your picture without hashtags and immediately comment them. It looks cleaner than putting hashtags in the caption. 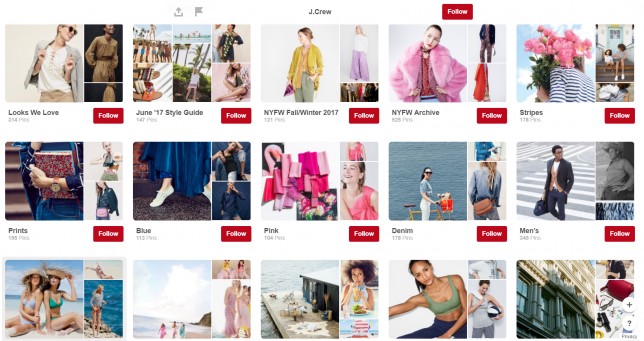 Remember that curation is key – Like your Instagram profile, make sure that your Pinterest boards are carefully curated. You should create boards that make it simple for potential customers to navigate to things they’re interested in. J.Crew, as you can see, has boards that make it easy for you to look at their jeans, their prints, or their stripes. Be aware that the Pinterest algorithm doesn’t necessarily surface your content quickly – It can often take up to 6 months for your content to really start appearing in people’s feeds. This means that, while you should be pinning your products, pages that will do best for you organically are likely to be links to your blog posts. You can write blog posts specifically for Pinterest, such as gifting guides that help get your brand lift and will then direct your customers on to your correct pages all year round. As for products, they’ll do great on Pinterest in ad form. Partner with the stores in the same location as you – If you’re in a strip mall or downtown area, you can ask the stores around you to offer your coupons to their customers (in return for you doing the same). The upside here is that you’ll be directly reaching people who are perfectly positioned to just pop by. The downside is that your neighbors’ clientele may not be your clientele. Partner with stores in the general area whose clientele are your clientele – If you have stores in the nearby area that service the same clientele as you, you can also ask them to offer your coupons. Alternately, if you worry that no one will be motivated to drive to you based on coupons, you can always take your business to your partner and set up a pop-up shop for a day. Partner with a local charity to put on an event – Customers these days are much more socially conscious and like to shop with brands who care. Partnering with a local charity offers you the chance to hit two birds with one stone: get your name out to a new set of people and show your customers you care about making a difference at the same time. Choose a charity whose values align with your own and set up an event! Email marketing is still the most effective marketing channel, with a 4400% ROI. Taking advantage of email to acquire new customers just requires a little savvy-ness. You can then send people who haven’t purchased yet targeted campaigns with first-time buy offers or giveaways. 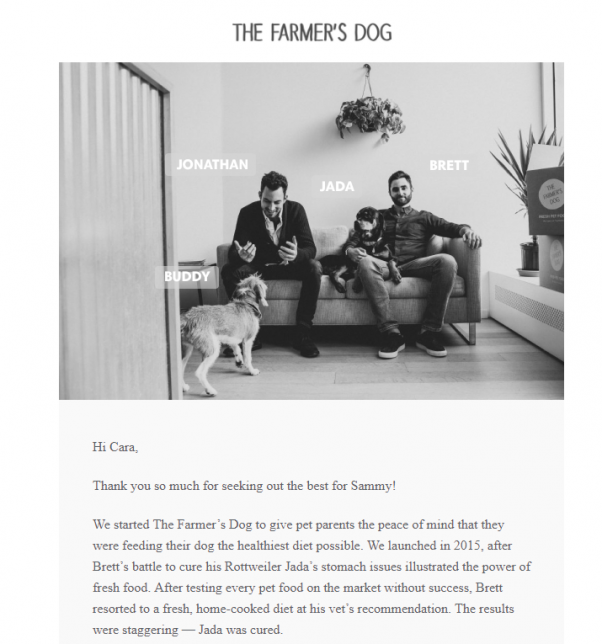 Showcase your story and values while you’re at it – Another great campaign idea is to send an email detailing your brand story. It’ll get people engaged with your brand and excited about your values. Provide value (period) – Email promotions aren’t the only way to acquire new customers. You also have to think about the long game of email + content marketing, in which you send valuable content without any hard sells or strings attached. This builds trust and positions your brand as an authority, so when people are ready to buy, they’ll think of you. Check out what The Dollar Shave Club (DSC) is doing. 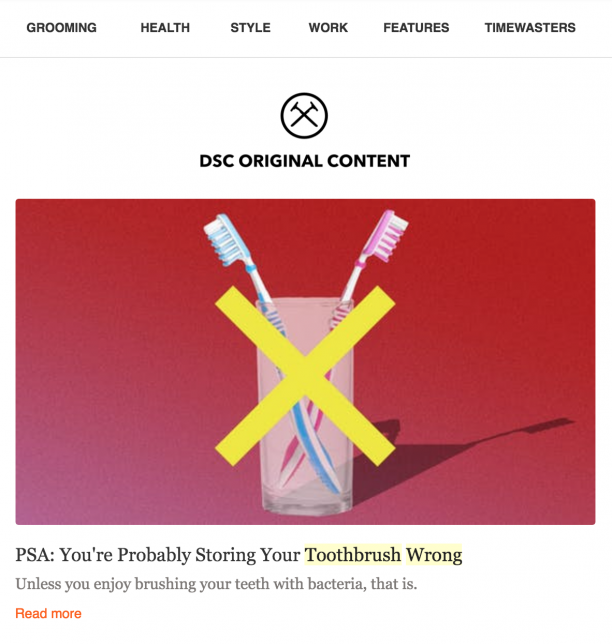 While DSC sends promotional emails now and then, they also have DSC “Original Content” emails that contain informative (and entertaining) articles on grooming, health, style, work, and more. These content pieces are non-salesy and they’re refreshing to read, especially when every other company out there keeps sending “SALE” or “BUY NOW! !” emails. The bottom line? Your email marketing strategy should have a mix of promotional and valuable content. Find the balance that works for your subscribers and go from there. These days, a nod or endorsement from an influencer carries more weight than traditional advertising. Why? Because people are more inclined to act on the recommendations of sources they know, like, and trust. This is why it pays to have an influencer strategy. Getting key individuals to recommend or talk about your brand can drive awareness, traffic, and ultimately, sales. The basis of influencer marketing is that your brand partners with a third party content creator who then pushes your products on their platform(s). One brand, Morphe, used influencer marketing to become in less than a decade one of the most powerful names in the beauty industry. Morphe was founded in 2008 with the very intention of using beauty influencers, particularly those on Youtube, as their primary way to generate sales. They have given many, many beauty influencers affiliate codes, but Morphe really refined the art of marketing by working very strategically with a certain few top influencers, whom they pay extra. They also collaborated with these influencers to create customized beauty items, like eyeshadow palettes, which the influencers then encouraged their huge followings to purchase. This strategy paid off in a big way when Morphe’s top influencer, Jaclyn Hill, delivered Morphe 1 million sales of her palette in 6 months last year. At $38/palette, that’s pretty life-changing for a brand. The best part about this story for your store? You can totally replicate their success! Morphe was an almost unknown brand when they first partnered with Hill, who was also relatively unknown at the time. Morphe prudently chose to invest in her early on and their partnership ultimately allowed both parties to flourish. If you’re looking to use affiliate marketing, follow Morphe’s footsteps and get strategic about who you’re investing in. Capitalize on word-of-mouth marketing with a referral campaign. While there are many variations on referral campaigns, the core idea is that you provide some sort of incentive for your happy customers to share the word about you to their friends. 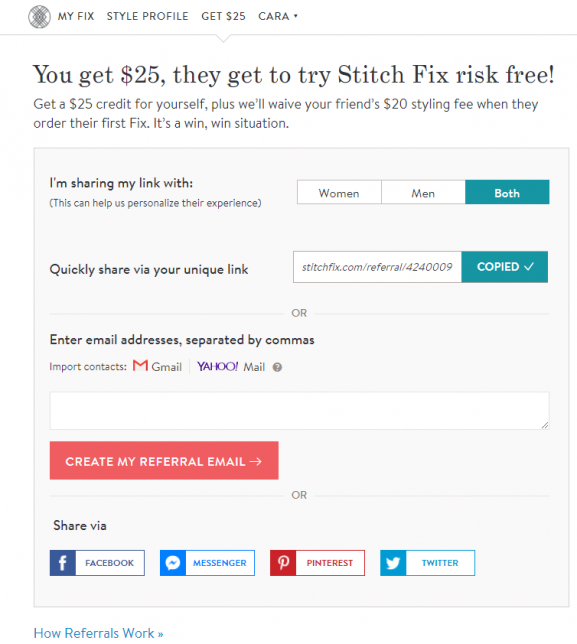 Stitch Fix, a fashion box company, has referral marketing down to an art. Their referral campaign is such a permanent part of their strategy that it actually has its own page on their website. Acquiring new customers can be daunting for a SMBs, but these strategies have worked wonders for many retailers. By testing different things out and analyzing your results, you’ll be able to figure out what works well for your brand. And take note that these retail marketing tactics are just the tip of the iceberg. There are plenty more ways to acquire new customers. You could try promotions, mobile marketing, or events, among other things. They key is to try different things, figure out what works, then go from there.